True, our relationship is still long-distance. I have to get my passport stamped everytime I cross the river from Cambridge, to visit him at the posh and proper Beacon Hill. But he's worth it! With more than 50 geekalicious offerings by the glass, a seasonally-rotating menu, and cozy, jewel-box of a dining room, I find myself wanting for nothing. Our meeting was somewhat accidental: Fellow blogger Daisy, of Indulge, Inspire, Imbibe, and I had agreed upon a date night in advance. This was the spot we had always been dying to go to but had never thought of until after the fact: L'espirit d'escalier made manifest. I was greeted warmly by the bartender, Rich. We had a friends and a former employer in common , and he proceeded to blind taste me on what Daisy was sipping upon (NB good friends should always start imbibing before you arrive....always! ): a gorgeous Roter Veltliner by Leth, one of my favorite producers. It was sumptuous, rich in both body & acidity. 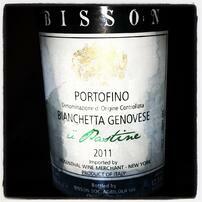 Given that variety is the spice of life I opted for another bartender's chocie: the Bisson Portofino Biancheta Genovese. I loves me some Ligurian whites: crisp, refreshing, quirky, and made to go with seafood-friendly. 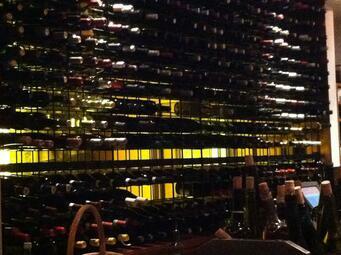 More importantly, the wine itself posesses that inimitable one. two punch of bright fresh citrus fruit, dazzling minerals, and pungent floral complexity. This is wine that is evocative of seaside cliffs and just the thing to cut through the early August heat and humidity. It also was a beautiful pairing with Saffron Risotto Balls that were our first course. They were served with a garnish of arugula and cherry tomatoes that possessed just the right acidity to both pair with the wine and the fried deliciousness. Course number two was Spring Arugula salad with Asparagus, Snap Peas, Orange & Shaved Pecorino and Beef Carpaccio with Arugula, Pecorino Cheese & Tarragon Citronette. Both were light, flavorful and just the right ticket to beat the heat. However pairing was a challenge. This was a tough combo - how to find something that would play well with the richness of the beef, as well as salad greens, asparagus and vinaigrettes. A white? A red? A compromise: Rosé! Yes, I said it - rosé! Don't let that sweet pink hue fool you, the best of these wines are bone dry with a vibrant acidity, the refreshment value of a white with the flavor profile of red. What's not to love? The Commanderie de Peyrassol Côtes du Provençe rosé is no exception, a classic example from one of my favorite regions. Flavors of strawberry, honeydew melon, rhubarb and slatey minerals were a perfect match for the salad and carpaccio. One of my favorite features of the by the glass program at Bin 26, is that they offer multiple sizes: 100, 250 or 500 ml respectively. Decision-phobes like myself don't have to settle for ust one or two offerings over the course of the evening. As such, Daisy and I were able to move on to a second pairing for finishing up our snacks. The heat wave left me craving a white, so I opted for the Phillipe Poirtier 2008 Quincy, a lesser known Sauvignon Blanc producing region from the Loire Valley. The extra bottle age added another layer of complexity to the usual citrus and grass flavors that mark wines from this region. the texture was richer, almost unctuous, with slight smokiness from both the flinty soils and the oxidation hat comes with age. As we finished our final sips, Rich kindly introduced us to the owner, Baback Bina, who playfully teased us for our late discovery. Bin 26 has been there 5 years: how had we not meet sooner? And just when I thought that I could not find any more to like, I did. 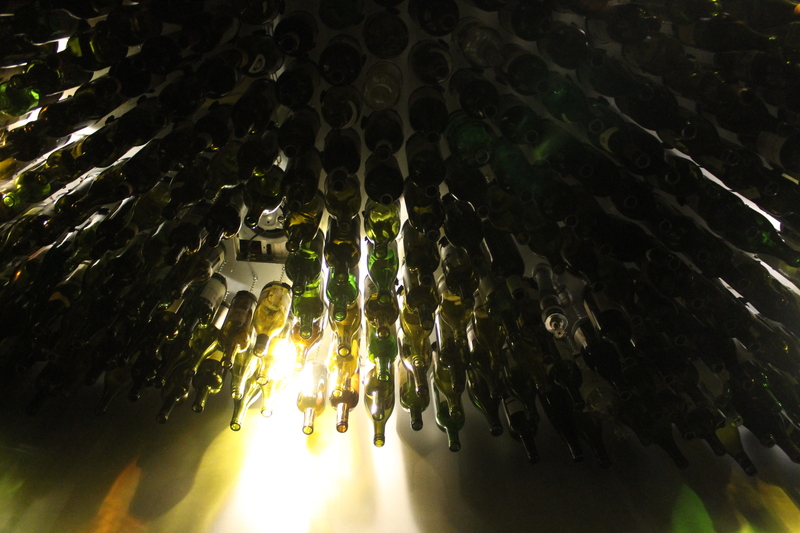 The back wall of the restaurant is a solid of pastiche of lovely wine labels, and the restroom ceiling is a mad chandelier of empty bottles. A remembrance of imbibes past. Please don't misunderstand me, Baron. I have not forgotten your rustic, Gallic charms: what young wine nerd could resist $3 stellar pours and unpasteurized cheeses served on overturned barriques after a late morning of shopping at the Marche d'aligre? But a girl must face the facts. I have grown up. My vinous world view has now extended beyond France's borders and I need someone that can appreciate and cultivate that. I hope that we can stay friends and, of course, we will always have Paris.